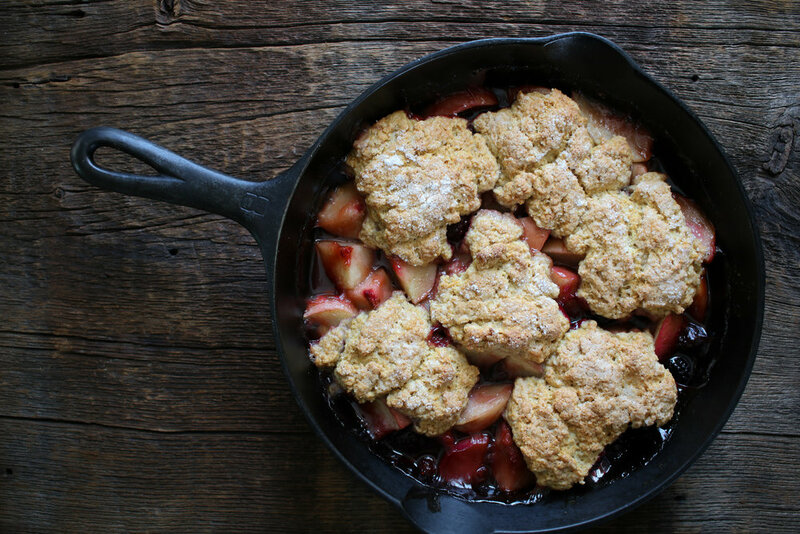 In a 10” cast iron pan, stir together the fruit, lemon juice, brown sugar, 2 tablespoons granulated sugar, cornstarch, water and cinnamon. toss to combine. In a bowl, stir together the flour, 2 1/2 tablespoons granulated maple sugar, baking powder, baking soda, and salt. With a fork, work in the butter until the mixture resembles coarse crumbs. In a small bowl, whisk together the yogurt, buttermilk, and stir into the flour mixture until just combined. It should be wet and sticky.